A Verb for Keeping Warm: Giveaway Monday! Hi! I'm Kristine and I own A Verb for Keeping Warm. I live in California. My shop is located in Oakland. I am inspired by the ocean and all it has to give; the textures, the color, and its complete largesse. This environment informs so much of what I make. One day, I went to India. I studied the applique work created by the Rabari, a group of semi-nomadic herders. 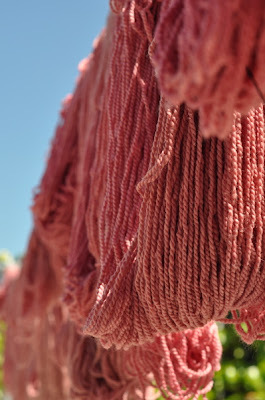 Inspired by them and this region, I began to practice natural dyeing. I returned to the U.S. and created a natural dye studio. The studio grew more and more until I created a much larger studio, shop, and classroom. Building a new shop allowed me to carry something I have loved my entire life - FABRIC. 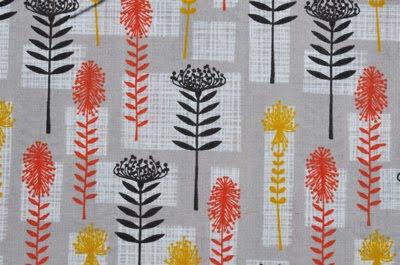 I adore bright, graphic prints in cotton and cotton / linen blends. Today, we have 5 for 5. 5 bundles of 5 fat quarters for 5 people. Guess what comes this week? New Nani-Iro fabric from Japan. Guess what you get if you win the giveaway? 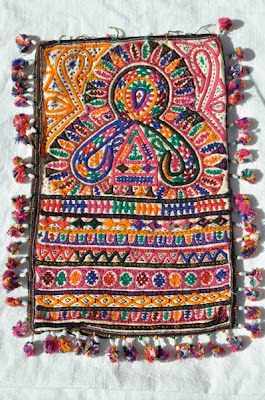 Nani-Iro fabric. 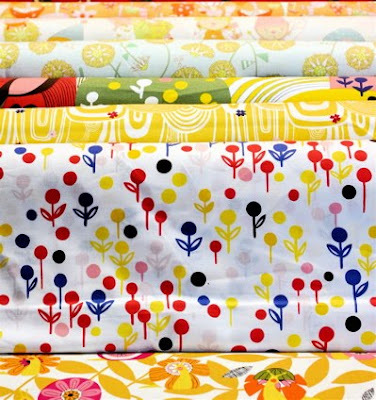 Plus, other new and sweet fabric from many other great companies and designers. To win, tell me where you go when you want to feel inspired. Comments will be open until May 25th. From your comments, I will randomly choose 5 people. Please check back on the 26th to see if you have won. 12am May 26th - Comments are now closed. Thank you to everyone who entered. The winners will be posted here by 6pm pst, May 26th. p.s. If you live in this area, I hope you will come by the shop. If you come into the shop, or you send a friend into the shop, the first 5 people to mention Giveaway Monday will get 5 FREE fat quarters. This offer expires on May 25th at 6pm. When I want to feel inspired I head to the ocean, too: where the Atlantic washes into North Wales in the Llyn Peninsula or the far reaches of Brittany, the small island which is home to my husband's family. Sea, sky, wind, flora and fauna. Hope to come to California this summer and the shop is definitely on my list of places to go!! Good morning! Wish I lived closer to your shop. It sounds inspiring. When I need inspiration, taking a walk outside is often all I need. The trees, flowers, animals, sky, sounds - all provide ideas. Many thanks for participating in this giveaway! So sad we are on opposite coasts, I'd love to visit your shop. I recently purchased some Nani-iro double gauze and it is beautiful. Thanks for hosting the giveaway - I'd love to be included. I love to hit the hammock in the backyard and stare up at the trees and passing clouds. I live in Maine, 10 miles from the coast. Whenever I need a bit of inspiration, I put my kayak in the back of my truck and head down to the bay for a paddle. It always gets my creative juices flowing. I go to the computer and look at everyone's great ideas for inspiration. I also like to go outside and look at nature. I pull out my collection of old quilt pictures. A great starting point. My inspiration is much like yours - the sea and beautiful scenery - though we have to travel to get to it. I just finished a needle-turned applique quilt inspired by trips to France & Hawaii. Found you from sew mama sew giveaway day. Will be visiting the area next week from NC...hope I get the chance to stop in the store. I'm usually inspired by the fabric itself. When I see a fabric, I usually know exactly what I want to do with it! Sadly, where I "go" to feel inspired is the internet--there are so many creative and inspiring people out there that I would not otherwise ever discover! Congratulations on following your passions, your shop looks beautiful! Thanks for the giveaway! Since I'm first commenter, I likely won't win anything, but it's nice of you to do it anyway for whoever does! i go to ayumi mills, amy of badskirt or very kerry berry flickr or blogs. very great stuff! I've loved your yarns and fibers, it's so great that you're carrying fabric now! For inspirations I love to browse ravelry and quilting blogs. There are so many incredibly talented people out there! When I want to be inspired I either browse Flickr, or head outside to clear my mind. Sometimes I just start sewing and see where it takes me so I'm actually productive with my inspiration! great post and giveaway....i just need to look at a fabric store to get inspired...usually working in my garden or kitchen i get ideas but i love looking at other's quilts and projects. I go out my back door for inspiration - rolling hills,mountains, and farmland! I love your shop- and your yarn! I am inspired by color. To feel inspired I love visiting my parents at their home on an island in Maine. Nothing like a walk in the woods or by the ocean to start thinking. Wish I lived in CA so i could visit your shop! Wait, is it kissing up if I say that your shop is where I come to feel inspired? But seriously, you carry such a beautiful selection of fabrics and yarns that I just can't help but feel uplifted by coming in! Thanks for the giveaway! When I need to feel inspired, I visit Ravelry (for the knitting) or flickr (for the quilting.) Never fails to get me in the mood to craft. Thanks for the giveaway! When I want to feel inspired, I search for fabric and supplies on Etsy and before I know it, the ideas are just flowing in! I like to go for a ride around the countryside here in Indianapolis. It's a great way for me to clear my head and gain inspiration! When I want to feel inspired, I go for a run...it doesn't matter where as long as it is outside! Thanks for the opportunity to win! oh, your shop is on my must-visit list. i've been admiring your dyeing & various fiber arts for years now. where i go to feel inspired. there are a few blogs: soulemama, needled, knitting iris. and a few places closer to home: my fiber loft, downtown (dallas), and into my garden for lots of touch-able inspiration and enjoyment. happy monday! thanks for the chance on the giveaway! It sounds beautiful! I'm a Kristine, too! My favorite inspirational places are all outdoors...usually forests in the mountains. I live in flat places, so whenever I get to spend time in the mountains, I try to take it all in! Ahh I wish I could visit your studio, but I am thousands of kilometres away! The grocery store inspires me (which sounds very strange when I actually say it out loud). When I am feeling listless or uncreative I walk to a grocery store about twenty minutes from my house and drift through the produce section. Fruits and vegetables are amazingly beautiful, and their colours and textures and shapes cheer me up and get me thinking about what to do with them. Usually after a grocery store visit, the uninspired day turns into a day with a delicious dinner and some feverish crafting activity all evening. I'm in the Bay Area too, and will have to come by and check out your amazing looking shop sometime when I visit my cousin Megan (who graciously pointed this out to me)! Living in a rural area just south of the city of Sonoma, all I need to do to get creatively inspired is to take a deep breath and open my eyes. The sun, the wind, the vineyards and pastures changing through the seasons, and the gently rolling hills studded with oaks -even if I'm not feeling creative it's a wonderful place to just be. I try to find inspiration all around me. I don't really have one special place. When I lived in Minneapolis, I used to go down by the Mississippi River when I wanted to feel inspired. Now that I live in San Diego, I like to go for a stroll through Balboa Park or hike some canyons and hills. Being outside and closer to nature helps leave daily city concerns behind. I go to New Hampshire for inspiration. Each season has its own color palette and there is everything from beaches to farm fields to snow peaked mountains. I go to my local park, with an overlook of downtown when I want to be inspired. When I want to feel inspired I go for a walk in the woods. I also love the ocean and the mountains. Basically, surround me with nature, and I'm good to go. To feel inspired I find the nearest LYS and am instantly inspired! If that doesnt work.... I grab my camera and just go for a walk, works every time. I head out into nature and most recently I went to the ocean in Cayucos. 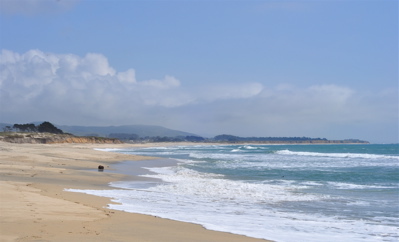 I like to ride my bike up or down the coast - Half Moon Bay to Santa Cruz is really nice, or up to Bodega or Tomales - or through gold country; each area has its own special light and scents, which trigger different inspiration. And, odd as it sounds, words inspire me all the time (As a linguist, I'm often unemployed, but full of inspiration...)! Am planning a bike trek to your shop, and that very cool bike-friendly cafe next door! When I need inspiration I look to people, places and events. I find many ideas by researching family members that have come before me. 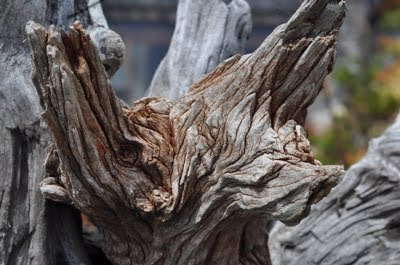 I am also greatly influenced by my surroundings, especially those things found in nature. I love taking a walk in an area that I have never been to before, or retracing my steps in the opposite direction. By doing this I find things that I many not have seen before! I NEVER leave home with out my camera. Some of my best design ideas have come from photos I've taken while out and about! When I want tio be inspired I go to my computer and start surfing for great pics. I go outside, when it's not noisy. i go to the lake in chicago!! I hate how hard it is to find places that sell fabric - if they also sell beads, or yarn, or what have you, lots of times the map searches don't bring them up. 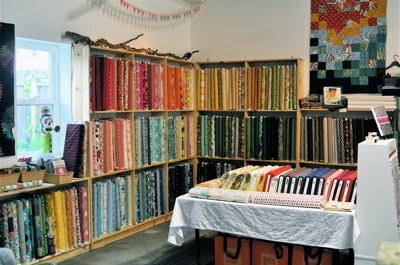 So, glad to hear about your shop - your fabric looks wonderful! I'm in the Bay Area MQG and we are talking about doing our own version of a shop hop, so I will add it to the list. so so so GLAD that i clicked on the giveaway monday link - i found an absolutely LOVELY store in my own backyard. i love love LOVE the look of your store and can't wait to get in there to see it in person!!! i might even sign myself up for a knitting class (or two). i visit many of the crafty blogs and for color inspiration I look outside! Holy cow, nice giveaway! When I want to feel inspired I usually go out into nature, walking through the woods or by the water, I just love all of the colors! When I want to feel inspired I can go just about anywhere. I seem to have a problem reigning in my inspiration because it strikes all the time in about every situation. All I really need is my notebook so I can contain the inspiration and my mind starts spinning with ideas. Sounds pretty lame, but I find most of my inspiration on the internet!! I usually look at blogs for my inspiration or my everyday life. The bookstore or the library...so much fun just waiting to be found there! I go to etsy and look around to get inspired! I go to my sewing room and look at my fabric, yarn, ribbon, etc. I have many places i seek inspiration...a walk in the woods, some time in my yurt weaving studio, dig in my fabric or yarn stash, a trip to a local fabric or yarn store, a walk thru an antique or thrift store....and there is always etsy or other online blogs...and let's not forget about ravelry too. Your shop is amazing and always an inspiration! I'm not confident enough in my sewing to be inspired by "outside things" and then translate them into cloth. Instead, I look to blogs like Oh Fransson or Film in the Fridge to be inspired and then do my take on the things they have done. I know, it's not super creative, but it's helping me gain confidence and see how to take real inspiration and do something crafty with it. I head to my local museum when I want to feel inspired. Either the fabric store or search the internet for inspiration! I go on my back porch and just feel the breeze and "get away from it all". Beautiful fabrics. Online and browse crafty blogs. I go anywhere outside. So lively, and every color you can think of. When I want to feel inspired, I take a walk around our driveway or down to the mailbox. We live in the country, have a big circular drive and then a 1/4 mile walk beneath big cedar trees to pick up our mail. The combination of the serenity, the mishmash of colors, and the quiet time never fails to settle me down and focus my thoughts on shape/color/contrast, which leads me right back to quilting. When I want to feel inspired, I go on Pinterest. There are so many wonderful ideas floating around ! I go to the beach, or the bay for my inspiration. The lighthouse, the birds, the waves...love it. my best place for inspiration is the modern art museum. i always get so many great ideas for quilts when i'm there. wow! next time I visit the Bay Area, I will have to check out your shop (live in TX now but have family in San Leandro) I am SO jealous of you visiting India - my dream is to visit there some day. thanks for the giveaway! I love nature when I want to be inspired, especially the sky! I'm a sewer, so I love to window shop and see all the new fashions, colors, and prints coming out. I usually find one or two things that inspire me to create something of my own or combine colors in new ways. I enjoyed looking over your blog! Thanks for including me in your lovely giveaway. I head outside to feel inspired, or at least peaceful. What a lovely give-away selection! Lovely post and pictures. I go to my stash when I want to be inspired. Love seeing beautiful fabric just waiting to be turned into something. Also flickr or pinterest to see beautiful pictures of what others have made. I thumb through Anthropolgie catalogs, various blogs and books and sometimes I just sit and stare! Where I go to feel inspired? The Pacific Ocean calls me, but sometimes I need something a little closer. There are great hikes within a ten minute drive from my home. In a pinch, a walk in my neighborhood with my camera gives me a creativity burst. I wish I could come visit your store - I don't think you opened it until after I moved away from Oakland. When I need inspiration, I go out and walk or run along the wooded trail near my house. It's quiet and green and lets me hear my own brain a little better. Wow, what a totally fabulous giveaway. I go to the library to get inspired sometime, to the art section. I love looking at old textile design books, folk art books, and modern art books especially. I feel most inspired whenever I am alone! No matter where I am. I don't have to go far to get inspired, I just watch my kids. How they play, twirl, look at their hands like they are the coolest things in the world. They are the inspiration for all my work. I have become a flickr addict, I am always inspired by the craftsmanship and creativity I find there. i just go outside to be inspired! i go to my studio! Outside with my flowers in the front yard. your shop is beautiful! When I want to be inspired, I go outside. no mater where I am, theres always something out there. Wow! Such interesting fabric. Would be great to sew with! I head to Ravelry or the bloggy world, because there's just so much inspiration out there! I usually look on internet, nature and image for my inspiration. When I need inspiration, I head over to flickr or pinterest, or just walk into my craft area and starting browsing through my fabrics/yarn stash. When I get a chance, vacations obviously give me a new perspective and inspiration, but I don't get to travel as often as I'd like! Thanks for sharing such a wonderful giveaway today! When I want to be inspired, I check out my favorite crafting websites, fabric designers and Martha Stewart's crafty section. When I want to be inspired, I go to one of the parks in town and watch the trees, squirrels, birds, and whatever else happens by. 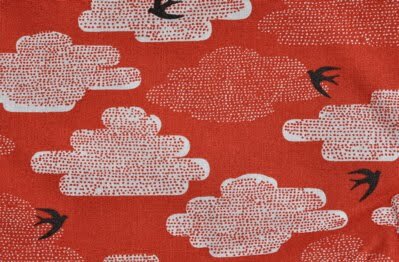 I *love* that red birds and clouds fabric. I know you're busy with all these comments and giveaway day, but I'd love to know what it is. I go outside for a walk for inspiration, or spend some time fondling yarn in my stash room. When I want to be inspired, I love going to the farm my husband grew up on in Jackson, TN. It's so calm and serene, and just allows me to unwind. I go to craftster.org when I want to feel inspired. Or I just go through my old stuff, letters, fabric, etc. Nostalgia always make me want to make something. I WISH I was in your area, but not too far. I'm in southern WA. My inspiration comes from all these sewing blogs! I have them RSS'd and it's just SO fun to check them weekly and see what people are creating! I've never seen fabric from Japan so this would be fabulous. They're beautiful and frankly, I'm not surprised. Thank you for the chance to win! When I need inspiration, I chat up a student. It sure would be fun to live near the ocean. The closest water are small rivers!! Plus lots of mountains. Thanks for such a great giveaway!! When I want to be inspired, I go up into the mountains. Beautiful. When I want to feel inspired, I've been finding myself wandering over to Pintrest. I'm in love with picking a board from the many that I follow and just browsing through it until I see something that sets my mind on fire and blazing off into new ideas. When I want to feel inspired I have to get outside and walk in the fresh air and see wild things. If I don't do it everyday I get all woogy! Definitely to my sewing room - or just to bed from some rest to hopefully wake up inspired in the morning. I'm sure this sounds non-inspired but I turn to the web when I want inspiration. Looking at blogs and seeing the wonderful things people makes inspires me to jump in and work on my own projects! To be inspired I like to be high up, near water - pretty specific, I suppose (also, I took this to mean physical location instead of websites?). I think it's because my parents live near a mountain from which you can see over a huge lake and the view always calms my mind from clutter and lets me think about what I want to do! Wow, what a lovely, generous giveaway! Many thanks. I usually start blog hopping when I need inspiration...it's so easy and convenient. I go to a yarn or fabric shop, and look at all the pretty yarns and fabrics, and browse through books. When I can't get to the rocky shore of my home island, I like to turn to the movies. The BBC is such a treasure trove of WWII-era Fair Isle jumpers and lacy feminine cardigans. I also like to stroll through the Portland Art Museum soaking up the colors used by the Oregon and California Impressionists. Other than the internet, I go driving. It's not so much watching the Taco Bells and Targets whiz by that's inspiring as the alone time to just sing mindlessly with the radio and think. When I want to feel inspired I come right where I am right now. I go to the internet and read blogs, and visit etsy shops and quilt shops. I am in awe of all the talented people there are - mothers, sisters, daughters, fathers, brothers, sons. All of you inspire me! I have a corner in my office full of books with art I'm inspired by, and that's one of the places I go when I need inspiration. I go to my blog roll for inspiration. so many good ideas! I love your yarns and would like just as much to visit your place... if ever I find myself in Oakland! I like going to the library for inspiration. I never know where it will come from, but I always find it there. I like to go to our closest lake. We have a camp there. Unfortunately then I am involved with awesome campers and not alone, but it's worth it. I love the mountains for inspiration. I wish I lived nearer to the store! It sounds amazing. Thank you for the giveaway! I go to books -- if they aren't on my shelf, they're probably at the local library. Projects that my friends make are also inspiring. Thanks for a great giveaway and congrats on a beautiful shop! When I want to feel inspired, I ask my 4 year old to help me craft! She makes up all sorts of crazy idea and while I don't usually follow her exact instructions (no honey, we can't dump glitter on the cards!) I always manage to find a fabulous idea while we're playing together! Surfing around the internet. I love looking at other people's quilts. I go outside. Up the mountains and through the woods. i go to my 3 1/2 year old son. My in-laws little tiny cottage on a little tiny lake. Great place to think, re-charge, renew! Just enough room to sew between naps on the porch. I go to the internet and look at pictures of sunsets and nature, blogs and amazon.com- you can look inside art books. Also, I get a lot of inspiration from nature films. This is kind of crazy, but when I want to feel inspired, I often head to the internet, where all of you fantastic people never fail to inspire me! Oh, I wish I'd come into the store today! I was in Redwood National Park last week. There's not much that's more inspiring than those dark, still forests. i go hiking when i want to be inspired. something about trees reaching up to the sky and down through the ground speaks to me! I go walking around my neighborhood to get inspiration. I go for a walk when I want to feel inspired. Nowhere in particular, but it gives me time to think. I'm going to be up near Oakland in a couple weeks. Hopefully I will have time to stop by your shop! My inspiration generally comes from looking at blogs and tutorials plus Flickr and Pinterest - so much to take in! When I need inspiration, I just go and stand in the fabric shop. 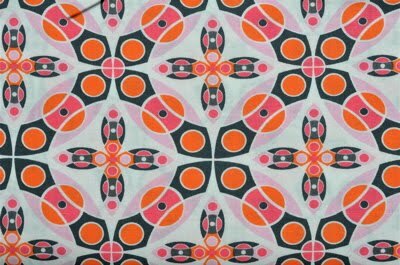 I always come up with a "need" for this fabric or that fabric. I love to get outside for inspiration. Thanks for the great giveaway. I find inspiration at my LQS. Just browsing around I can always find fabric to fall in love with, and then we go from there! When I want to feel inspired, I go to the Huntington Library and Gardens near my house :) Thank you so much for this wonderful giveaway! I love to go for walks, either at the bay or in the woods along the paths around the ponds. It helps to clear my head and shed the stress of the day and then my mind goes into a creative mode again. Oh my! I love Japanese fabric. I would love to win your giveaway. When I am looking for inspiration, going outside will do the trick for me. Thanks for the chance to win. Pick me! When I want to feel inspired I go outside! Whether it's a neat architectural detail or a cool plant or someone wearing an awesome dress I can always find something to inspire me. When I want to feel inspired, I go for a drive. I live in Maine and there's gorgeous scenery everywhere, but the best thing is to just get lost. Not too lost, but to go far enough and take enough turns to end up somewhere I've never been before. I just go outside and be. We have a beautiful backyard full of citrus trees. To feel inspired, I often go into the woods or onto my computer (radically different, but both can do it). I'll be in NorCal in about 5 weeks and would love to check out your shop. When I want to be inspired, I go to my camera. (I know, it's not a place) Looking at things in the shape of the lens, looking at framing everyday objects for a picture makes me want to make amazing things. I go to my fabric cabinet, and I just start pulling out colors that I feel like on that particular day. I'm into patchwork lately, so something lovely usually comes out of it! Usually my sewing room has all the inspiration I need -- stacks of beautiful fabrics and lots of books full of great ideas. 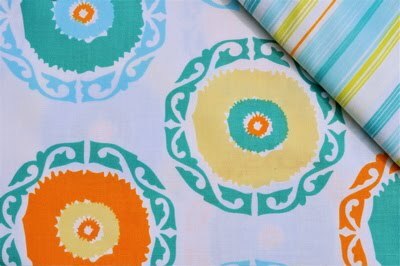 I've been a fan of your yarn and patterns for quite a while -- now that I'm getting into sewing, here you are with this beautiful fabric! What inspires me is the internet -- the way it brings me the news that millions of people are creating around the world, that we are adorning our world and not just inhabiting it. What a generous giveaway! Lately when I want to be inspired, I enter the wonderful, large world of sewing blog-land - I always find something new and fresh I want to try! This is a great prize. Thanks for a chance to win. I get inspired by taking a drive. I love just looking at the fields and the beach. I love browsing Flickr for inspiration! Ooh your blog is beautiful! When I want to get inspired, I go for walks with my camera. And I try to capture teeny, tiny things at interesting angles. Of course I'm no pro. And I don't even have a professional grade camera. But the activity inspires me nonetheless! 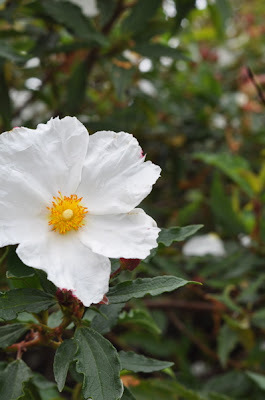 Check out my blog to see what I've seen. I always "think" that my inspiration is serendipitous, and with that being said, it does seem that it is always seem that nature inspires me. I'm working on a shawl with hand-dyed merino. I was in Death Valley this spring and took a picture of a rock that was covered with an almost florescent fungi covering it. I captioned the photo: "I will come home to dye some yarn to match". Nature knows its colors. Anything outdoors will leave me inspired, but I really love walks in the woods! Of course, trips to the beach are always nice! So happy to be introduced to you and your work! Being from the Great Plains, I am inspired by wide open spaces - the prairies and horizon to horizon sky. Beautiful. For inspiration I love looking thru the many blogs on the internet and finding new ideas that I would never have come across before. There are so many great creative people out there!! I definitely am inspired by other bloggers, but also by buildings and tile and brickwork that are all around us. Thanks for a great giveaway and lovely post! I have a bench outside in front of the leyland cypruses to block the neighbors, and in between two flower beds. Its very peaceful there. When I am able, I head to a Florida beach for inspiration, but since I can't do that too often (I live in Maryland), I head to a local fabric shop, where I will always find something that calls to me. Thanks for a super giveaway. I am a gardener, so this time of year is especially inspiring for me in the garden. I spend time outside in nature to be inspired, the ocean, lakes, rivers and waterfalls of the pacific Northwest where I live are incredibly inspirational. I go stand next to a waterfall whenever I need a soul cleanse. Driving out in the country makes me want to paint, hiking always makes me want to knit and going to festivals in the summer time always makes me want to sew. To be inspired I go to my garden the colors and shapes there help me plan quilts. This is going to sound silly--but I get inspired in the bathtub. Something about the peaceful quiet in the warm water sets my mind free and all the colors and patterns and images going through my mind distill and I come up with wonderful ideas! To feel inspired, I go to the woods! Beautiful fabric! When I want to be inspired I go to the forest. I also find inspiration with fellow fiber artists. I love to cruise Ravelry and a whole bunch of quilting blogs for inspiration. Thanks for the great giveaway. I love to be at home to get inspried. Sure beats the law school library!! I go online when I want to be inspired. Thanks for the chance to enter & also for sharing a bit more about your path. When I need to be inspired I go for a walk or just check out flickr. I get inspired just looking at the world around me. More than anything it is people that get me motivated to create something - I love giving. To feel inspired I need water. Lakes and streams surrounded by woods are best. Actually, to get inspired I usually flip through some magazines and watch some of my favorite shows (which are adult animation shows). Both have bright colors and different graphics that can inspire me and be platforms to work off of. When I want to feel inspired, I either go to my favorite biodynamic farm where I'm friends with the farmers or I go to one of the local parks around Nashville to hike up wooded hills. I find a lot of creativity involves letting go so you can fill up with the good stuff! I just head outside, whatever the weather... then I come inside and browse some fabric collections! It's not very natural, but I go to flickr for sewing inspiration. Great giveaway - thanks for the chance! When I want to feel inspired I visit my sister. We both live in New Hampshire, but I live in the "city" (well, they call it that...it's not really a city) and she lives in the woods...love it there! I love being near water, be it an ocean or lake or river. It seems so peaceful and inspirational and relaxing. When that's not an option, I just love the library. Not just to read the books, but I love the feeling of being surrounded by all of the possibilities.